As you can see there’s a lot of water in us. 42 litres is nearly 9 galloons!! Most of it is within cells (2/3rds) and most of the rest between cells in the interstitial space. Blood plasma is only 10% of your entire fluid body, CSF is a minute 0.5%! In any event, its no wonder the body so easily dissolves to a fluid state. In a recent conversation with Michael Shea, he mentioned he had heard that the Max Planck Institute in Germany has been doing research (as yet unpublished) that shows the fluid content of the body is much greater than previously thought – a huge 92%. 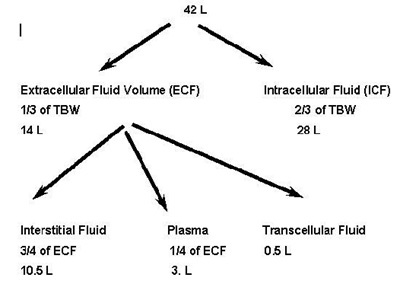 So even more explanation for the emergence of the fluid body in BCST. What’s particularly interesting is that there seems to be no change in the amount through the whole life span. Existing research and thinking is that the embryo and fetus are much higher in fluid state than the adult body. How exciting if in fact we are no different in our fluid mass from our earliest days.